Neptune Bath Lift Offers Excellent Bathing Experience. Mountway's Neptune Bath Lift has been designed in close consultation with both professional carers and a variety of users, to ensure that it offers an excellent bathing experience. The Neptune offers impressive legroom, sits low in the bath and is one of the lightest battery-powered bath lifts available. Neptune’s unique design also allows the Neptune to be fitted in almost any style of bath, making it a highly versatile and great all-round bath lift. 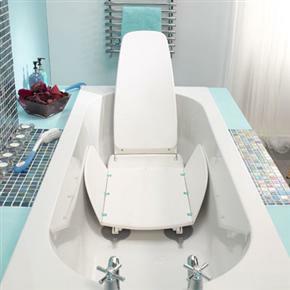 The Neptune’s four strong suction feet allow the bath lift to remain stable during use. The Neptune has a high weight capacity of 25 stone / 160kgs. An easily rechargeable battery powers the motor, so there are no high voltages and no electrical installation to present a hazard in the bathroom. In addition, to ensure that there is enough charge in the battery, a length system in the handset indicates the battery status. The lightweight Neptune is fully portable and is simple to take in and out of the bath. 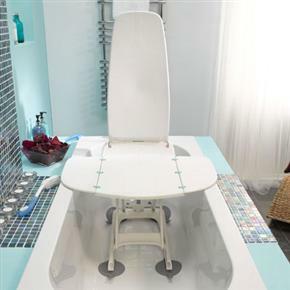 The seat can be instantly detached from the frame, making the Neptune one of the easiest bath lifts to use when it comes to moving and handling. The Neptune has been designed for effortless cleaning. 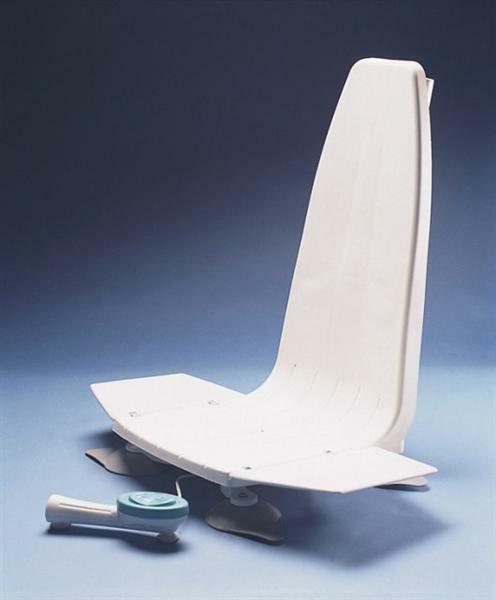 The seat and the frame are easy to wipe clean and because there is no integral padding, there’s no risk of splitting. The waterproof handset incorporates a large, easy-to-use, rocker switch. This can be operated by fingertips or by the feel of the hand, or even by an elbow. A battery status monitoring system indicates the charge level in the battery. A safety feature is also included that will not allow the bath lift to descend if there is insufficient battery life for a complete bathing cycle. The battery stick is easy to remove for recharging outside the bathroom. The natural rubber suction feet fitted to the Neptune are larger and more flexible than others available. This gives the Neptune a secure fitting to curved surfaces, suiting most shapes and sizes of bath. The strong, wide side flaps facilitate transfer on and off the seat. The contoured shape offers protection for the user during the raising and lowering of the Neptune. The quality of materials used, combined with control gained through UK manufacture of the Neptune, contributes to it’s long-term cost-effectiveness. The Neptune frame is guaranteed for 5 years, with all other components, excluding the battery, guaranteed for 2 years. The battery is guaranteed for 1 year. Nice bathlift , neat looking and easy to use. Very quick delivery. Easy to lift out of the bath when not required.